Stratégir tests new and existing products using purchase process simulations and high-definition virtual shelves. 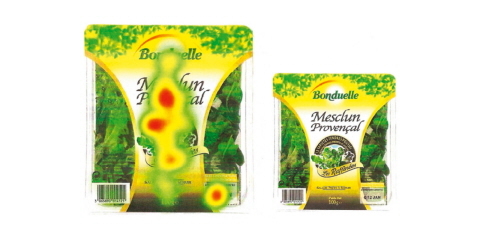 Eye tracking completes impact evaluations of packages and shelf positioning. Conclusions drawn from this package design study resulted in a 15 % sales growth. Changing a package is a major decision for a brand owner as any modifications can dramatically influence the sales figures. Some changes can increase sales but we also know of past examples where sales have dropped by nearly 40%! The expertise at Stratégir is based on 15 years of package testing and more than 1,000 design tests. This experience has led us to consider with great care the different indicators that measure impact quality of a package: will the new design be more noticeable on the shelves? The more it is seen, the more likely it is to be bought and vice versa. The impact on the consumer is the sine qua non condition of success. In a second test phase, we focus on evaluating attractiveness: does this package appeal more to the consumer? We all know that there’s a difference between the behavior and feedback of consumers, between what they do and what they say they do. Eye tracking records precisely where a consumer is looking and opens the door to understanding how consumers search for information on the packaging. By "impact", Stratégir means the impact of the brand. That is to say, the percentage of people who are able to name it. It is therefore a measure of what the consumer states, which can be true or false. 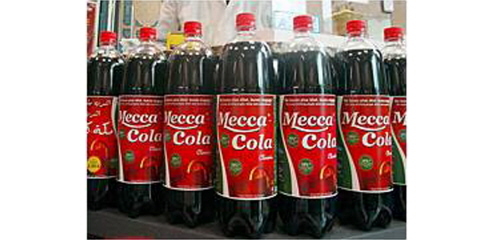 If we show the picture to the right to a consumer for one second they will spontaneously name... "Coca Cola"! And yet it isn't Coca Cola but a brand which has used the same coding, schemes and colors. look at the packaging to recognize it and does not even need to see it on the shelf to name it! This is the so-called "phantom impact". On the other hand, a consumer may not even be able to name a brand which they have seen if it is not well-known. Therefore, product impact is a combination of both visual impact and recognition-memorization processes. Also, in certain markets where there are very few well-known brands, the consumer's feedback does not help the brand owner identify the best solution for improving a package, nor whether the change will result in a gain in impact or a loss of brand and product recognition. Eye tracking provides objective details on what the consumer looks at. It constitutes an excellent complementary tool in evaluating product impact as it is not based on consumer feedback, which as we have seen can give ambiguous answers. Will my product be purchased more often? There are several factors which can influence the answer to this question. One of the key phases in brand and product analysis consists in understanding how consumers perceive a package. How do they decode the packaging? Did they perceive the "promises" of the product? Which elements captured their attention? Again, eye tracking can provide significant information in complement with consumer feedback. The eye tracker accurately measures the elements observed: the brand, pictures, captions, etc. and provides the answers as to how a package design can best be improved – increase the size of the text, re-structure it or removing it entirely, for example. The joint analysis of consumer feedback (e.g. I like/dislike, I understood, I remember) and observation maps (e.g. heat maps, gaze plots) gives valuable information on how the consumer "appropriates" the package. Eye tracking cannot, however, measure the attractiveness of a particular color, shape or element for one given product: comparisons of different package designs are needed in order to obtain such conclusions. The original design, with heterogeneous graphics and packaging, did not convey the benefits of the product. In this study, the eye tracking data provided valuable input on how the consumers – i.e. buyers of ready-made salads – "scanned" the package. With the original design, the consumers scanned the entire package. The heat map generated by Tobii Pro Studio eye tracking software clearly showed that the brand was rarely seen and the consumer needed to browse the whole package to find the required information. On the left is the new packaging with a more homogeneous graphical design, where the information is structured in a way that guides the consumer's gaze. This new design is much more effective. 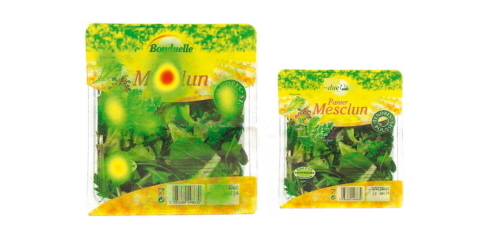 More areas are observed by almost all of the consumers (see the red spots) whereas on the original design only the variety of the salad (Mesclun) was observed by most. The consumer's gaze is guided by the new funnel shape of the packaging. This constitutes a real improvement in product impact – the brand is seen more on the new updated packaging. In this test, only 28% of participants observed the brand on the original design compared with 44% on the new version! With the new design, the consumer was able to locate the relevant information and browse the different varieties of salad much more quickly – the "time to first fixation" is half that of the old design (see graphic below).